A Metal Roof is a type of roof which is made from metal pieces or tiles and is one of the components of a construction design. These Metal roofs have been used for a long time but the patterns of the ancient times and the ones used in present days, vary so much. Nowadays, metal roofs are available in a variety of colors, designs and structures which gives them a more attractive look. The metal roofing price is also affodable here where you can get medium price. Installation of metal roofing costs a lot higher as compare than the others. However, this type of roofing is long lasting and is the best and much preferred than other kinds of roofing existing in the market. Metal roofs have an attractive look and these are light in weight. One, who is selecting this roof for his/her home or building, can choose its color from the huge range of colors available in the market. The important aspect of this roofing is that it lasts for a long time with all the elements of nature. Installation of metal roofing is costly, however, the price is covered up many times fold, due to its ability and strength to endure for the years to come. If you want stability and endurance, metal roofs are the best option to select. It might look pricey on paper but after having an intensive look on it, one will realize its unbelievable advantages. Metal roofs need least maintenance. These are costly just because of the material it includes, and its technical installation procedure, which needs training and specialized skill. This roof takes a longer time for its installation. 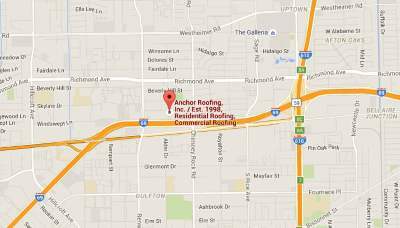 Anchor Roofing in the city of Houston are the best service provider, having a team of highly skilled roofing professionals. Many things are taken into consideration before calculating its price, though, cost calculation is mainly depends on the cost of per square foot. The procedure to calculate its roof is, adding the total area to roof pitch which is needed by the user. The calculated amount by this method consists of, cost of the material, all labor and installation. Metal roofs protects against strong blowing winds, fires and are also extremely resistant against most callous weather conditions like snow, hurricanes, sleet, scorching heat, wildfires, heavy rains etc. As mentioned above, the initial installation cost of metal roof is pricey and is covered up for the long period of time. There is no or little maintenance required to keep this roof intact. This is because of the metals used in constructing the roof is galvanized alloys which have been made rust free like aluminum, reinforced steel etc. The over time cost of the metal roof is less as compare to other type of roofs which requires a frequent maintenance, repair or may be replacements. This roof last for a long time i.e. 40 to 75 years. Metal roofing can be recycled and is also labor efficient.